*I requested a copy of this book from the author or publisher for review. Olivia does her best to make a home for her daughter, Em, and give her everything she deserves by hunting down pulse activated artifacts for private paying clients. 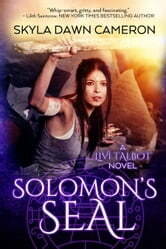 When the check bounces for her daughters prestigious school, Olivia takes a job that takes her away from home and into the underground caves with a new crew of experts. While she's 'leading' the expedition to find the ring of Solomon, Livi will learn there are more than 'activated' artifacts that have come to life since the Pulse. Livi'll have to dive into the mouth of danger to save herself and those around her that become friends. And that's only in the caves, what she faces when she returns home will drive all maternal instincts to kick in. Skyla has packaged several things I rarely see together, and yet love as a combination. Adventure with danger, a mother and family connections, and a hot man that's a potential love interest (for me and the lead character). The story feels like a cross between Tomb Raiders and a single, hard-working mom with a supernatural feel to the world since the Pulse occurred. The artifacts of the past are activated and can be dangerous with the powers they possess. The creatures that can be present! Oooh never know what I'm going to come across in this world! Olivia, Livi as I like to call her, is one strong woman! She's a single mom making ends meet in the world. She has a strong sense of rules about her when it comes to a team she works with. She also has a quick mind with what needs to be done on the job as nothing is what is expected and in retorts to others. There is a strong family connection present for Livi. Well, where her daughter is concerned. Livi, like every parent, wants the best for Em and works hard to get it. Sure work pulls her away time to time but being a single working parent it happens. But Livi has support and help. Pru, her best friend, has been there through thick and thin. Pru is an important element in the family and also has normal human troubles that ties the story to the world we know. Pru lives with MS. These friends are there for each other and help each through the tribulations of life. Now Livi also has troubles in the way of family, with her father and absent mother but that is a topic for later. We also have a connection that sparks with new friend ties. Dawson is the first to connect with ease with Livi. But there are others as we read that gives a feel of a full cast of characters that are needed to get the job done. I'm hoping to see several of them again in the future! Lets talk about West. Um! Hot! He's a dangerous man but feels to have a baseline to his ways as well. He's not always around, but when he was I loved seeing him and Livi interact. There was a flirtation between them I found put a smile on my face as they bantered. Buttons! lol. I can't wait to see them together more as the books come! Skyla draws many great elements together for us in the book. The world's not perfect and even Livi's world is the same way. Pru lives with MS. It's something they all work through as a family, Livi, Em, and Pru. There is so much support here and it's amazing! There are family troubles. Livi is on the outs with her father but still talks to her brother. Livi lives with not knowing who Em's father is yet there is a great man from Livi's past that is willing to be the father figure for Em. Totally an awesome step for him! Then we learn of West's past, just a drop, and where he's from - North Korea. There are terrible things that happen to people there. But through all these hard times and memories, there is the fun and love and enjoyment of having people around that do love you. Livi and all the characters keep their chin up and move on through the days making the best of all they have and do. It's well written with a balanced blend of humor and adventure you can't deny is spellbinding. Skyla's smooth writing easily walks me through the dangers with Livi. I could picture what was happening, even though I've never been caving. Thank you Skyla for creating a story with so many extraordinary elements that I've been wanting together while keeping the story real and grounded. I loved this book. It had speed. It had plenty of snark... which I love. And the plot was believable. Ms Cameron's character were nicely drawn out. She paid good attention to her protagonists. Great start to a series. Unfortunately, I have to wait for the next one due out in Feb, 17. Book has everything, really funny likeable main character in Livi with complex family relationships (not a loner heroine!). Olivia is brave and strong, the villain is scary, the adventure exciting. LOVE THIS NEW SERIES. Thank you, whoever rec'ed this author to me. This was too much fun. Literally, I really need to be doing housework right now. But this book is well-written, the characters are so fun and I can't wait to read the next in this series. I really enjoyed your book---and have purchased the next one.I find it hard to believe that someone with your talent---is small minded about Republicans.They are people ----just like democrats.